WTI crude prices are down to approximately $45.25/b this morning after a sharp collapse yesterday. Another sharp collapse overnight is being moderated by some morning buying. WTI opened at $45.51/b today, a major drop of $2.09, or 4.39%, below yesterday’s opening price. Current WTI prices are $45.23/b, down $0.29 below yesterday’s closing price. 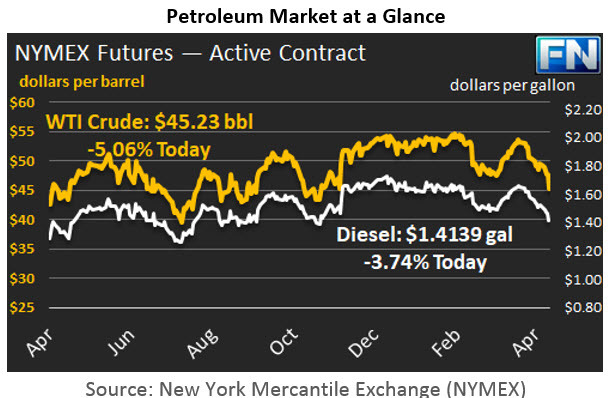 Both crude and product prices trended down this week, with a marked drop yesterday. 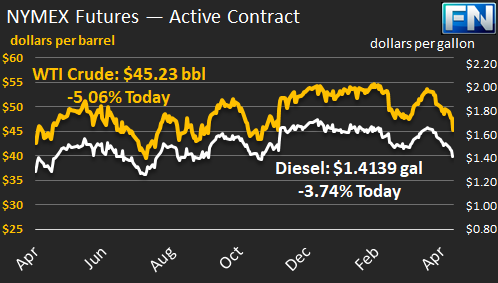 Overnight, WTI prices plunged as low as $43.76/b before some early morning buying brought prices back above $45/b. Crude prices have retreated to where they were in November, prior to OPEC making its historic production cut deal. WTI crude prices have opened lower in twelve of the last sixteen trading sessions, falling by 14.8% ($7.89/b) since April 12th.Product prices also dropped sharply yesterday and are languishing this morning. Diesel opened at $1.4114/gallon in today’s trading session. This was a serious drop of 5.77 cents (3.93%) below yesterday’s opening price. Current prices are $1.4139/gallon, up by 0.16 cents from yesterday’s closing price. Diesel prices have opened lower for fourteen of the last sixteen trading sessions, dropping by 24.31 cents, or 14.7%, since April 12th. Diesel prices are at their lowest point since mid-November. Gasoline opened at $1.4825/gallon today, a drop of 4.39 cents, or 2.88%, from yesterday’s opening. This was the lowest opening price since February 8th. Prices are $1.4789/gallon currently, a decrease of 0.23 cents from yesterday’s close. Gasoline prices have opened lower in fifteen of the last sixteen trading sessions, dropping by a total of 28.14 cents, or 16.0%, since April 12th. Although the global crude market is forecast to reach a better supply-demand balance this year, several developments this week heightened concern that the oversupply will linger beyond what was forecast. First, U.S. crude production continues to rise, and demand growth has been sluggish. Second, U.S. oil inventories failed to show the across-the-board drawdowns expected. Third, the OPEC-NOPEC production cut compliance rate was revised down slightly. Even at high compliance rates, it is taking time to drain excess inventories. Analysts and investment houses vary widely in their assessments of when a better supply and demand balance will be reached, whether OPEC will agree upon an extension, and whether such an extension will be effective. Fourth, Libyan crude supplies were restored after another disruption caused by civil unrest. In a surprise move, the leaders of the two rival governments met in the UAE and held what were called “breakthrough” talks that have the potential to end years of internal strife. Fayez al-Sarraj is the head of the official UN-backed government known as the Government of National Accord (GNA.) The key military opponent is General Khalifa Haftar, who heads the self-declared Libyan National Army and leads a competing administration. The two parties reportedly agreed in principle to hold elections in 2018 and to a power-sharing deal. The U.S. Jobs Report has just been released, and the results are better than expected. The consensus expectation was for 190,000 jobs to be added in April, and for the unemployment rate to increase to 4.6%. The Bureau of Labor Statistics (BLS) reported that payroll employment rose by 211,000 in April, and the unemployment rate declined to 4.4%.